In the two minutes you take to read this page, more than 24 children under the age of five will die. In 24 hours, the total will exceed 17,000. Most of them will be victims of diarrhoea, pneumonia, malaria or complications before, during and after birth. Nearly half of these deaths are linked to undernutrition. None of these children need to die. More than 100 million deaths are preventable between now and 2035.This is why World Vision works alongside communities globally, finding new and innovative ways to improve the lives of children in poverty and put an end to needless deaths and ill health. Our health work includes in-the-field programmes that prevent and treat undernutrition, support mothers and newborn babies, strengthen local healthcare systems and make access to healthcare easier. In 2011, almost seven million children didn’t reach their fifth birthday. Every day 800 women die from causes related to pregnancy and childbirth. And of these maternal deaths, half occur in fragile and conflict-affected states, most of them are girls under the age of 15. Unfair systems and structures that keep women and children in poverty. All of the above affect critically the health of women and children, especially those living in the world’s poorest places. Understanding why these preventable deaths happen enables us to work to overcome them, to help bring good health back to affected children, families and communities. To help address the underlying causes of preventable deaths, World Vision UK has developed a range of initiatives and projects that sustainably improve nutrition and food security and support maternal, newborn and child health in some of the world’s most difficult places to live. Call for all governments, multilateral agencies and other stakeholders to be accountable for their maternal and child health commitments. To strengthen our health projects and policies, World Vision works at local, regional, national and international level – from educating and empowering individuals and communities to advocate for quality healthcare to influencing government bodies to help ensure the delivery and reach of quality health and nutrition services. In the UK, we work to ensure that our government, multilateral agencies and other stakeholders are making appropriate commitments to maternal, newborn and child health commitments and are accountable for their effective delivery. During 2013, our work in 66 projects, based in 25 countries, contributed to the improved health of 1,459,040 children, now less fearful of hunger and sickness. Understanding that good nutrition is fundamental to good health, we ran 23 nutrition projects in 11 countries in 2013. The work of these projects ranged from supplying food supplements and treating undernourished children to supporting breastfeeding mothers and educating communities about the value of good hygiene. 18,000 children were treated for acute malnutrition, with results well above international standards. 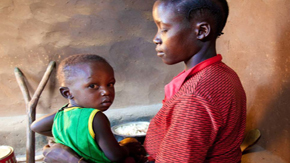 This included the most vulnerable children in Angola during times of severe food shortage. The number of children immunised increased by an average of 22%. While we do all we can to improve nutrition and support pregnant and nursing mothers, poverty remains the biggest cause of ill health. In 2013, we worked in 20 countries to improve the livelihoods and food supply of 672,381 people by introducing irrigation schemes and diversifying crops, enabling communities to grow more nutritious food. Here are two examples of how we have contributed to the improved maternal health of women in Pakistan and to reducing undernutrition among children living in Bolivia. For more information on the work we do, visit the charity campaigns pages of the Get Involved section. Shaheen (pictured above) is a young mother of two from Pakistan. When she had her first baby, there were complications, which made her anxious about the birth of her second child. Her anxiety was exacerbated by her earlier experience with a Traditional Birth Attendant (TBA) who, due to lack of sufficient knowledge, tried to deliver her first baby when she wasn’t actually in labour. Although many TBAs in the region where Shaheen lives are not medically trained and lack the right experience, unfortunately the practice of using them is common. For many women, because of lack of awareness or facilities, giving birth in hospital is not always an available option. As the birth of her second child approached, Shaheen’s increasing anxiety became a cause of concern. Fortunately for Shaheen, a World Vision Social Mobiliser was able to intervene during a routine visit. She provided Shaheen and her family with information that explained how a hospital delivery would be safer. This encouraged her family to support a hospital delivery. Shaheen delivered a healthy baby boy in a hospital labour room assisted by a trained midwife. Alfredo’s home is in Moscoma, a remote mountainous community in Bolivia. He lives there with his wife (pictured above) and two children. Unfortunately, the soil in Moscoma is ill suited to growing the nutritious food that children need for good nutrition and growth. Because of this, the malnutrition of children here is a health concern, but with the support of World Vision and the engagement of community members like Alfredo – who has been trained to identify malnutrition, to encourage use of the health centre and share knowledge about nutrition with families – the health of children is improving. Alfredo says: “It is very clear when a child is not well fed…when I see it, I notify the health centre. I’ve seen many cases of malnutrition and we have recovered many little children who would be dead by now”. With World Vision’s help, Afredo’s community has learned about family planning, about preventing, identifying and treating malnourished children and how to grow more nutritious crops – building a better, more hopeful future for Moscoma’s children.